A knife, that cuts, is a valuable and appreciated practical implement, and has been for millennia. A knife that cuts, and cuts extremely well, is treasured as a craft taken to the level of art. And a knife that isn't even useful for the purpose of cutting, but has been totally infused and transformed by pure imagination, can become sought after as a royal treasure and symbol of sheer power and authority. A friend and I were recently discussing the interrelationship between functionalism and art. I was describing for him some African weapons I possess– a nine-foot spear in particular– that are so beautifully and expertly made, with so little resources available, that they are surely wondrous examples of functional art. The function of these weapons (to intimidate and to kill) has so directed their design and fabrication that a spare and elegant aesthetic has floated to their surface. The combination of dark steel head and tail (glinting with silver highlights where worn and polished), with amber wooden shaft and hard rawhide edge sheath is a study in contrasting materials. The tapering steel tail is perfectly balanced visually with the curving razor edges of the point. And the art to be appreciated in this spear is not visual only. The heft of the spear's mass is satisfying but surprisingly light. The balance is exceptional as gripping the wooden shaft in its center so verifies. The feel of the wooden shaft is incredibly smooth, yet it is hard to imagine it slipping out of the hand, as the diameter perfectly suits the encircling fingers and palm. Shaking the spear activates the weapon system's substantial flexibility and toughness. This is a sculptural work of the highest order. And it can defend and disseminate justice to boot. This kind of art sprouts out of the ground of necessity, but when taken to its final conclusion becomes art of yet another level. I spoke to my friend about another colleague who had become enthralled with amateur archeology. Along the way, he began learning the art of flint knapping– the skill of percussively flaking and shaping a chunk of hard, brittle stone into a useful, sharp-edged tool. 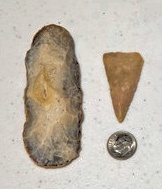 This is the craft utilized in the making of stone arrowheads. I once borrowed from him some magazines devoted to the modern revival of this art. On the cover of one of these journals was the photograph of something the likes of which I had not only never seen before, but never even imagined was possible. The stone piece was some kind of "knife," but I use the term "knife" with definite reservation, as this "knife" could never be used to actually cut something. Instead of a smooth, continuous and gently curving blade, there was a "blade" that had been totally interrupted by curves within curves within curves. 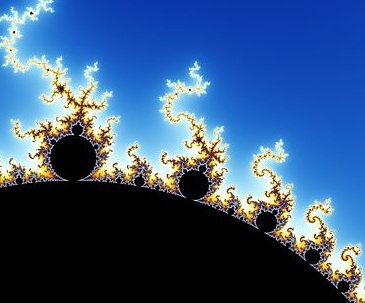 The "edge" had the overall effect of something akin to the Mandelbrot "fractal" set. The detail and complexity of the edge alone nearly took my breath away. And how could something like this possibly be made by the difficult-to-control process of breaking rocks? It seemed close to impossible for a human being to actually make something like this– let alone conceive it in the first place. Some years after seeing this astounding piece of art, I came across what was probably the inspiration for such a work. There are many (dozens, maybe hundreds) of examples of Mayan archeological artifacts that have been referred to as "eccentric flints." These objects are knife-like flint-knapped ornaments (I hesitate to call them tools) that almost defie description. 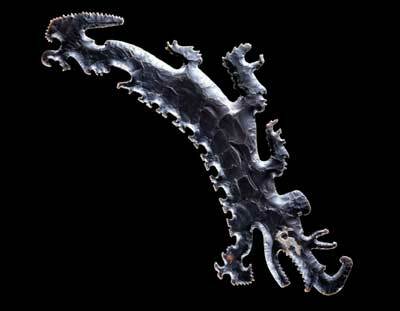 Many of them possess the same doubly (or even triply) detailed edges like a fractal pattern. One of the most interesting I have come across is in the possession of the Dallas Museum of Art. This piece is referred to as "Crocodile Canoe With Passengers." The work displays a known Mayan creation myth wherein the first beings ride into existence in a canoe formed from a crocodile-god (presumably, the Milky Way). Knowing some of the highly skilled processes necessary, I cannot even imagine how the artist first approached the creation of this piece centuries ago. And how many attempts were either fatally flawed or even totally destroyed before completing the example the Museum now has? What kind of high-flying imagination and optimism did it take to think that such a thing was even possible? This kind of art has totally transcended any notion of functionalism. These flints were most probably prized by kings and priests as representative and declarative of their positions of power. These were treasures no longer useful for the practical purpose of cutting something, but instead, were so highly valued simply because they were so rare, so beautiful, and so improbable. The extraordinary difficulty of making such a piece guaranteed that it possessed some power of its own, and perhaps could even bestow some of that power upon its owner. This brings us back to a central question of "why art?" Perhaps part of our appreciation of and desire to own art is that we, too, desire to somehow have "rub off" on us the power of the art that we so admire– that somehow the beauty and attraction of art can become our own personal attributes as well. My recent exhibit for the Parade of Artists show in Boerne was a wonderful success. I had the distinct pleasure of conversing with great folks from the Hill Country region, and from as far away as Washington, Michigan, and Cape Cod. It's always stimulating as an artist to not only have the opportunity to talk with art lovers about my work, but also to hear their own responses to it and engage in some deep, thoughtful interaction. Some of my conversations with them were totally unexpected, and surprising in their depth and significance. It's also great to see some of my work going home with people who have appreciated some of the same things that I appreciate. When you are able to make this kind of connection with people it is a special event. One young man came into my exhibit early Saturday morning and sort of woke me up with a "simple" question: "Do you try to convey any message with your art?" The question somewhat startled me, and I began to stumble through something of an answer to his question. Pretty soon, though, the conversation took a decided turn away from the "small" (but deep) universe of aesthetics and the meaning and purpose of art. We eventually found ourselves wandering down an entirely different conversational street of profound relevance to both our lives, but of even greater significance than the relatively ephemeral nature of art. We were both blessed to have received such a gift. Art has an amazing capacity to speak to and from the deep recesses of people's minds and hearts. And it is not simply an end in itself, but can be a gateway to those things that really last, and really matter. I hope to remember this as I go about my work of attempting to capture the presence of beauty and truth. This coming weekend promises to be a wonderful time of getting to know professional artists and their work. For the second time, I will have the opportunity of participating in the Boerne Professional Artists' annual Parade of Artists. This event will take place at multiple venues throughout downtown Boerne, Texas on April 13-15, and there is no charge for the event. The basis for the Parade is an "open house" of sorts for many of the several galleries in Boerne who will be hosting the works of many BPA members. There are also several "other venues" around town that will be hosting the works of other BPA members. Last year, I had the pleasure of showing my work during the Parade at Ye Kendall Inn/Limestone Grill, at the end of Boerne's main Plaza, just off Main Street. The management of the historic and landmark Inn so appreciated my art that they invited me to show my work there indefinitely. My work hangs in the limestone-walled fireplace room between the Grill and the Inn, where I change it out every several weeks. I will be on hand the entire weekend to speak with you about my work and anything else that might interest you. For the Parade event, all artists (there are over 30) will be at their respective venues to discuss their work and engage in generally enriching conversation. All work shown is also for sale, and some wonderful pieces will be going home with their new owners. The fine art that will be available is first class, professional work and will encompass oil, acrylic, and pastel paintings, sculpture, photography, ceramics, and mixed media. The Parade begins with Friday's "Art Collectors' Preview" evening from 6 to 9PM. If you want to find that "special piece" and reserve it before most of the public arrives Saturday and Sunday, don't miss Friday evening. Saturday's Parade will extend from 10AM to 8PM, and is a collaboration this year between the Parade and Boerne's Second Saturday Art and Wine, so many of the venues will also offer complimentary wine or other beverages and hors d’oeuvres from 4 to 8PM (during this time, a free trolley will also pickup and deliver patrons to and from all venues). <<<see artists Donald Darst and Pamela Gardner talk about it on Great Day SA>>> Sunday will wrap it up with open hours from 11 to 5PM. Brochures (including a map to all the venues) are available at all of the venues, and at most other businesses in downtown Boerne. Or, you can print out the map below. 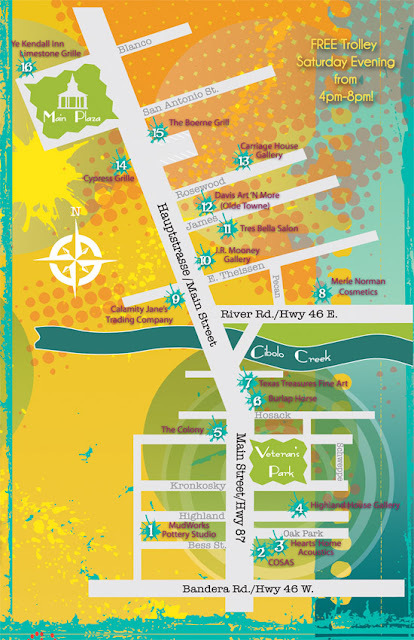 Come out to Boerne this weekend and enjoy seeing some marvelous art, and talk directly with the artists who create these pieces! Also— don't forget that I will be drawing the name of someone from my email subscription list who will receive a free fine art panoramic photograph of mine. The winner will be able to choose one of four photographs in my wildflowers series. If you aren't yet on my email subscription list, you can easily sign up in the box in the right sidebar ("Follow Bill by email"). In my previous post I alluded to my article coming about through circumstances that mirrored Andrew Pressman's description of the interesting results that can occur when free-wheeling collaborative efforts are at work. He explains that "The serious and sometimes accidental business of generating a good idea is enjoyable." This was certainly the case when Michael passed the Architectural Record article on to me. We had plenty of laughter and knowing glances at each other after the fact. 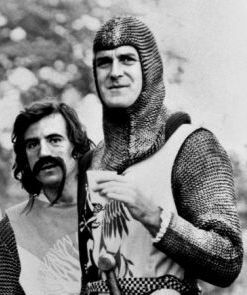 "Describing the process Monty Python used to develop comedy sketches, John Cleese said, 'The really good idea is always traceable back quite a long way, often to a not very good idea which sparked off another idea that was only slightly better, which somebody else misunderstood in such a way that they then said something which was really rather interesting.'" I believe that what Michael was wanting me to see was Pressman's lauding the serendipitous nature of good results in the production of art. Michael and I have spoken often of this principal, and I have written several posts here on such, so it was interesting to see someone else's (Pressman's) take on this. But a further interesting thing was this: beyond the simple serendipity connection, the article was mainly about collaborative effort. As I read through the article, the gears began to turn in my head, and I found myself rapidly formulating an article on the collaborative nature of my own "solo" artistic pursuits (previous post). This was not Michael's intent, of course, but fully in parallel with John Cleese's description of the amazing twists and turns that usually occur for "...something really rather interesting." The Pressman article had a couple of other statements that also piqued my interest. He quotes Scott Simpson, principal and senior director at the Cambridge, Massachusetts office of KlingStubbins: "Collaboration is an attitude more than a process..." and it can "...add richness and depth to the project, but this means that ego must take a back seat." There is no question that this is the case. One must be truly open to relating to individuals, thoughts, and circumstances from outside one's self to reap these rich and deep gifts. Finally, Pressman quotes Len Charney, head of practice at the Boston Architectural College– "It's not technology, it's psychology." Though Charney here is speaking primarily of architectural practice, I believe this principle is certainly germane to the photographic arts as well. So often, I hear fellow photographers, enthusiasts, and patrons ask about what equipment and processes I use in my art. They want to know the number of megapixels, the model of lens, jpeg/tiff/raw formats, printer profiles, etc. It causes me to wonder if, when they view a fine painting, they are compelled to ask the artist: "What brand and sizes of brushes did you use...how do you mix your colors...how tight did you stretch the canvas?" Although all of these technical matters are certainly important and influence the resulting art, it doesn't seem they should overshadow the "psychological" aspects of the result. What the artist was thinking or feeling at the time she produced the painting (or photograph) would seem more significant. Or even– "what do I think or feel as a viewer of this work of art? "– would be a much more important question to ask than: "Is that canvas made of linen, cotton, or a 50/50 poly-blend?"